Polyester film, as discussed in this report, refers to a high-performance biaxially oriented polyethylene terephthalate (BOPET) film made from polyethylene terephthalate (PET) resin. Asia, in particular China, is by far the largest producer and consumer of polyester film. The second-largest producer and consumer in order of importance is the EMEA region, closely followed by North America. On a country level, India is actually the largest producer and consumer after China, closely followed by South Korea. China used to be a net importer of BOPET film, especially of high-end optical film. As Chinese polyester film capacity has gradually grown, domestic production has correspondingly increased to meet domestic demand. Consequently the country became a net exporter of BOPET film in 2016. 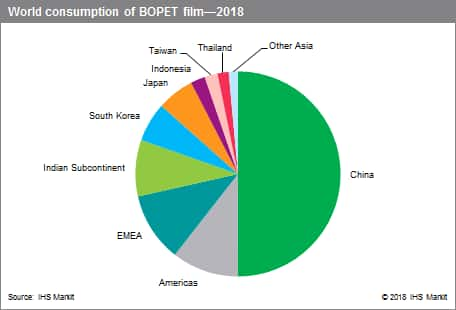 Packaging represents the largest end-use market for BOPET film (57%), followed by industrial (25%), which includes flat panel displays, and electrical/electronic (10%). These three end uses account for almost the total of global consumption. Twelve-micron-thick BOPET film is the standard grade used for packaging applications and it is considered a low-end product compared with the thicker film used for optical applications and for some specialty industrial and electrical uses. Stand-up and retort pouches, peelable lids, and metallized film used for snack food packaging are among the most successful applications for BOPET film in packaging. During the last decade, the increasing emphasis on longer shelf life, solid waste reduction, and changing lifestyle standards in developing countries have led to an increase in the per capita consumption of packaging material, thus driving BOPET film consumption growth in this sector. Demand for BOPET in the industrial sector includes numerous and various applications such as reprographics, hotstamping film, thermal-transfer ribbons, security films, release films, adhesive tapes, and labels and decals. Pressure-sensitive labels and thermal-transfer ribbons have been one of the most successful applications during the last 5– 10 years. Pressure-sensitive labels are self-adhesive and do not require fasteners, glue, or heat to stick. These labels find increasing application in the beverage, beauty, and household industries because of their no-label look, as well in the automotive and appliance industries because of their durability. Thermal-transfer ribbons are used for bar coding in supermarkets. Some of these applications require the use of special-grade thick BOPET film, with thickness ranging from 36 to 125 microns. The electrical/electronic end-use market includes traditional applications such as photoresists, motor and generator insulation, wire and cable wrap, membrane switches, capacitors, and flexible printed circuits, as well as relatively new applications such as flat panel displays (FPDs) and solar cells. Many of these applications use thick BOPET film. In flat panel displays, polyester film can be used for parts (as diffusion, antireflection, prism, and white film) or in production processes as a release and protection film. In solar cells, polyester film is used in the construction of back sheets. South Korea, China, Japan, and Taiwan together account for almost all of this consumption. China is continuing to invest in the production of optical-grade films in order to decrease its dependency on imported material. Demand for FPD film is growing quite fast, at an estimated average annual rate of 6–7%. In Other Asia, especially in Japan, demand is slowing. Factors inhibiting the growth include a display technology shift from LCD to OLED, which does not require PET film, as well as the replacement of PET film with cellulose triacetate film or acrylic film for polarizing plate protection. On the other side, there is a trend toward larger TVs, needing larger film. Therefore, demand in Japan and Other Asia has remained fairly stable during the last three years. Consumption of polyester film in traditional end-use markets such as magnetic media and photographic films has dramatically declined during the last few years because of the new competing digital technologies. In developed economies such as Europe, the United States, and Japan, consumption of polyester film for magnetic media applications has become insignificant. It is expected that global consumption of BOPET film will continue to increase, but at a slower pace. For the next few years, the market is expected to remain oversupplied. Strategic Report - China Propane Dehydrogenation: Global Disruption on the Horizon?